Have you created your Easter cards yet? North Coast Creations has some adorable stamp sets for your Easter and Spring cards and projects, be sure to check them out here. 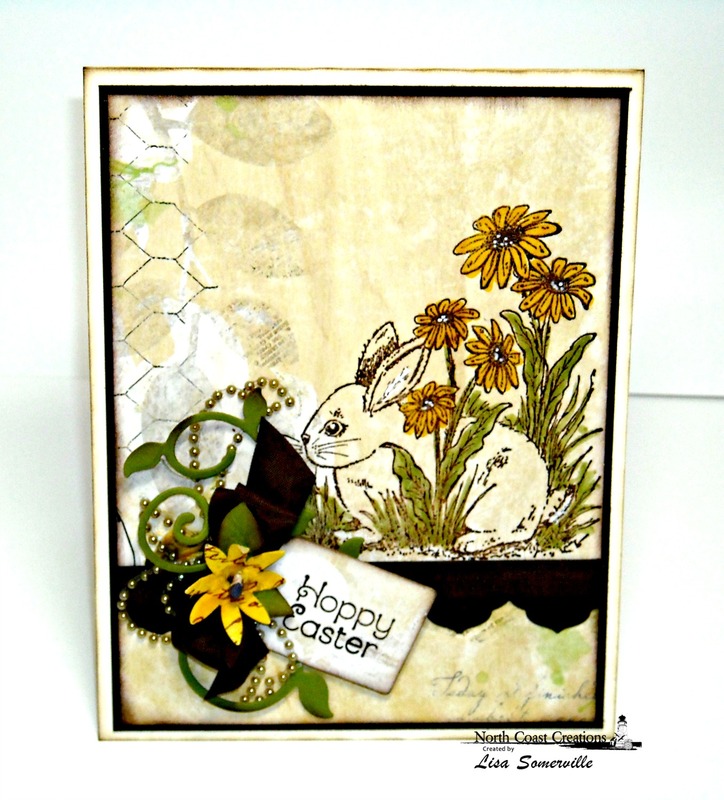 To create my card, I used North Coast Creations Hoppy Easter stamp set along with some Custom Dies from Our Daily Bread Designs. I stamped the image in Espresso ink on the Bo Bunny pattern paper, then Clear Embossed. To add color to the image I used STAEDTLER Karat Aquarell Watercolor Markers, adding a few highlights with a White Gel Pen. To embellish I added die cut a border die from Espresso card stock using Our Daily Bread Designs Custom Antique Labels and Border Dies, a stamped tag using the sentiment from North Coast Creations Hoppy Easter set Brown embossed on pattern paper then die cut using the ODBD Custom Recipe Card and Tags Dies. To further embellish, I added Vintage Brown Seam Binding, Zva Creative Crystal Gems and a flourish die cut from Olive card stock using the ODBD Custom Fancy Foliage Die. Awesome, awesome design, Lisa!!! I love that you stamped the image directly onto the designer paper and your embellishments are just right.....beautiful work!!!!! HUGS!! I agree totally.....love this! The paper and image are a beautiful combo! So pretty, Lisa! Love the paper and the image stamped on top. The trim and tag accent it perfectly. how pretty stamped right on the dp! A gorgeous Easter creation with beautiful design and colouring.